I love the bright colours against the dark, ominous sky. If you look in the to right hand corner, you can just see the secondary rainbow behind it. I am choosing to take this as an omen that I WILL get lots of productive thesis work done today, in spite of being in one of those “I feel like I can’t do anything” slumps. I’ve now seen half a dozen separate rainbows come and go today. The “showers” we are having are abrupt torrential downpours, and then we get sunshine, then downpours again. I’m not sure what, if anything, I view as a an omen. My mind just doesn’t grok them. And here’s a rainbow-iridescence shot of a giant bubble-blower in Hyde Park – I love the reflections of the surrounding buildings amongst all the colours. Heh, well I certainly don’t see omens as signs from heaven or anything like that. Personally, I just think of it as finding something in my environment that reflects my current mindset. Oh, I don’t have any pictures, but osprey are my good omen. An extra good omen is an osprey carrying a fish in its mouth. Ah, I rather like that way of looking at such things. You are the best, and you are correct, they do carry them in their claws, and I always say ti wrong for some reason. I saw an osprey with a fish in its claws when I found out I was getting an interview for the med school I am going to now. So did my former mother in law when I told her! I also saw one the day I found out about my fellowship. It’s not like I see them all the time, either. 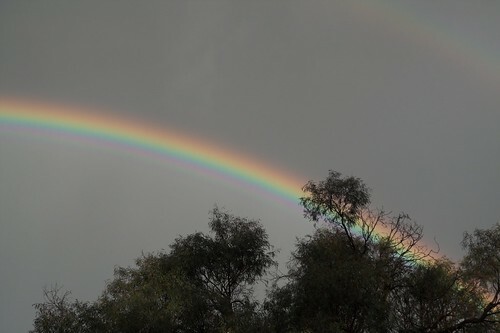 I wish I could find the shot (it was on that old “film” stuff) – but when I went to Uluru, I saw a rainbow over it at sunrise. Breathtaking.